Imagine, if you will, that you just woke up in a hospital with no recollection of how you ended up there? Furthermore, you are not in your native country, your wife doesn't recognize you, and no one believes you are you. This is the scenario that Dr. Martin Harris (Liam Neeson from Taken, and Batman Begins) is presented with in the latest thriller from Dark Castle and Warner Bros. Entertainment, Unknown. While in theaters, Unknown immediately drew criticism from reviewers and audiences alike that this film was a clone of Liam Neeson's other European thriller. Taken, however, upon closer examination one could easily make the case that this is only true at a high level. While both share a European setting, and a thrill/high octane atmosphere, Unknown characters are more fleshed out, and rely more on the psychological aspect of the film versus just action set pieces. The cast of Unknown, including January Jones (X-Men: First Class), the always lovely Diane Kruger (Inglorious Basterds), Aidan Quinn (Legends of The Fall), Bruno Ganz (Downfall), and Frank Langella (Frost/Nixon) are at the top of their game. Their performances are quite convincing as each play their part to perfection, and never border upon the absurd. Director Jaume Collet-Serra (Orphan) is once again given the directing reigns from Dark Castle Entertainment, and their trust in him is justified. The film dark tone is perfectly conceived through the dreary, blue tinged streets of Berlin; and the framing of each scene, rivals that of even some of today's top directors. Unknown's picture palette translates flawlessly on the Blu-ray release of the film providing an exact replica of what director, Jaume Collet-Serra, intended. In fact, the overall picture quality of this release is dare say reference quality and revivals most huge blockbuster Blu-ray release picture quality. Warner Bros DTS-HD Master 5.1 audio track used on this release is crisp and effortlessly handles the dialogue scenes to perfection as well as the action. While Warner Bros treatment of the film itself is pristine, the extra included on the disc is unfortunately the exact opposite. Aside from the usual digital copy included, the Unknown Blu-ray sports only two, five-minute fluff pieces on the making of the film that add zero value to the disc. Unknown is an amazing film with a smart cast, great director, and heart pounding story line. If you enjoyed films such as The French Connection, Bourne, or Taken, you will be fully memorized by this film. One can only hope Warner Bros. releases a more full-featured release in the future to showcase this amazing film. 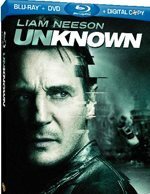 Download Unknown from the iTunes Store in Digial HD. For more information about Unknown visit the FlickDirect Movie Database. Mr. English is president and is in charge of overseeing all mobile app development. Eric English, has loved movies ever since he was a little Jedi master. Though he mainly enjoys comedies such as The Big Lebowski, and In Bruges his taste in movies spans a wide genre of film. Read more reviews and content by Eric English.